CRAZY DISCOUNT! Was: $279.00 Now: $179.96! 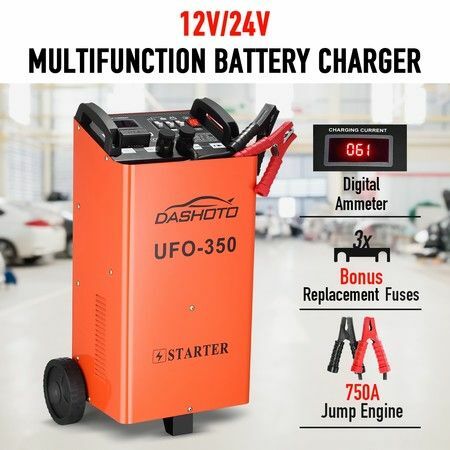 Look no further than this multifunctional jump starter to avoid the hassle of being stranded on the road when your car runs out of power! This practical 750A 12v/24v car battery charger features both fast and slow charge settings to meet your needs. Equipped with a digital LCD display to show the remaining power and charge rate. The jump starter pact kit comes with two large rubber wheels and a handle for portable use. Constructed with a built-to-last sprayed iron shell. Suitable for lead-acid and GEL batteries. Perfect for jump-starting your car, ATV, boat, tractor, truck and more. 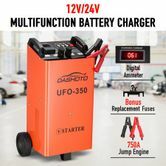 Hesitate no more in purchasing such a practical battery jump starter to keep your car always on the move! 62cm x 36cm x 30.5cm approx. 65cm x 37.5cm x 27cm approx.